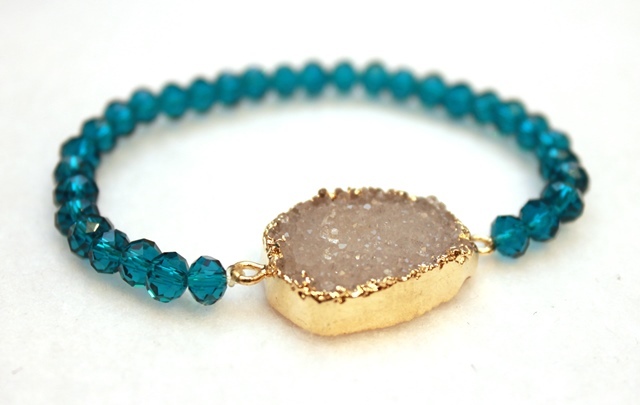 This eye-catching bracelet showcases a refined taupe druzy pendant made of natural crystal quartz on a blue colored crystal bead stretch bracelet – perfect to wear solo or contrasted with additional bracelets. Gold toned backing on pendant. One size fits most. Thank you for supporting Cayetano Legacy Collection! Every jewelry item is handmade with genuine, natural stones. You will own a one-of-a-kind piece of art. The sales tax charged depends on where the order is shipped. You will be able to view the sales tax included in your order before your order is confirmed. All orders are shipped within 5-7 days of order confirmation, unless otherwise notified, to all addresses within the continental us. International orders will take longer, in which case you will be notified prior to your charge. A tracking number will be emailed to you when your order ships. This tracking number will allow you to check on the delivery status of your order. The shipping cost is $8.95 for 1-2 piece orders shipping from our distribution centers to addresses within the continental us. 3-4 piece orders are charged $13.00. Orders of 5 or more pieces are charged $21.00. Oversized or special delivery items, and items shipped internationally, may be subject to a delivery charge in addition to the above standard shipping rate, in which case you will be notified prior to your charge. Cayetano Legacy Collection, Inc. Ships most orders via ups. Unfortunately we cannot ship to P.O. Box addresses. We are not able to reship packages that are returned to us by the carrier. All undelivered packages will be processed as a return. Please take this into consideration when selecting your shipping address for an order. We’re happy to help! Please email us at info@cayetanolegacy.com and we’ll respond to your questions and comments within 48 hours. This eye-catching bracelet showcases a refined light pink-purple druzy pendant made of natural crystal quartz on a champagne colored crystal bead stretch bracelet – perfect to wear solo or contrasted with additional bracelets. Gold toned backing on pendant. One size fits most. 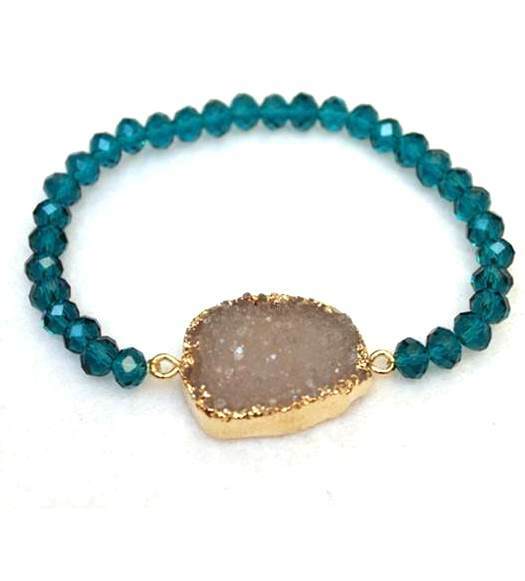 This eye-catching bracelet showcases a refined emerald green druzy pendant made of natural crystal quartz on a taupe crystal bead stretch bracelet – perfect to wear solo or contrasted with additional bracelets. Gold toned backing on pendant. One size fits most.